Marching Scarlet Knights "The Pride of New Jersey"
The Rutgers Scarlet Knights football team represents Rutgers University in the Football Bowl Subdivision (FBS) of the National Collegiate Athletics Association (NCAA). The team was formerly a member of the American Athletic Conference (formerly the Big East), of which it was a football member since 1991. Rutgers joined the Big Ten Conference on July 1, 2014. Rutgers plays its home games at High Point Solutions Stadium, located on the university's Piscataway, New Jersey campus. The team is currently coached by Chris Ash. The Rutgers University football program is considered to be one of the most historic programs in the country. In 1869, Rutgers defeated Princeton University by a score of 6–4 in what is considered to be the first ever intercollegiate football game. For this reason, Rutgers has been affectionately described as "The Birthplace of College Football." The team currently holds an all-time record of 641–622–42, giving Rutgers the 37th most victories among NCAA FBS programs. As of the conclusion of the 2014 season, Rutgers has appeared in ten bowl games, of which it has won six. On November 6, 1869, Rutgers and nearby neighbor Princeton competed in the first ever intercollegiate football game. The site for the contest was a small plot of land where the College Avenue currently stands on Rutgers' campus in New Brunswick, New Jersey. The structure of the game resembled more of a rugby-style contest instead of modern-day football, with players allowed to kick and bat the ball with their fists and hands. At the time, Rutgers was referred to as the Queensmen, a homage to the school's chartered name of Queen's College. The Rutgers squad was captained by William J. Leggett and donned scarlet kerchiefs atop their heads in an effort to distinguish between the two teams. Rutgers would go on to win the contest by a score of 6 goals to 4. A week after the first game was held in New Brunswick, Rutgers would visit Princeton for a second matchup. This time, Princeton prevailed by a score of 8 goals to 0. Rutgers and Princeton had planned for a third game in the 1869 season, but the contest never took place due to fears that the games were interfering with the students' studies. Thus, both schools would end the season with a record of 1-1. 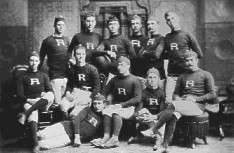 Rutgers first undefeated season was in 1876. From 1929 to 1975, Rutgers was a member of the Middle Three Conference, which consisted of a round-robin against Lafayette College and Lehigh University. Starting in 1940, the 'conference champion' received the Little Brass Cannon. Following Lehigh's capture of the Little Brass Cannon in 1951, Rutgers became an independent team in 1952, though it still played Lafayette and continued the Middle Three round-robin in 1953. Although Rutgers continued to be a part of the Middle Three until 1975, the Scarlet Knights became a member of the Middle Atlantic Conference from 1958 to 1961. The college won the conference championship in three of those four years (1958, 1960, and 1961) and was awarded the Wilmington Touchdown Club Trophy. The 1961 season was particularly remarkable as it was the Scarlet Knights' first undefeated season (9–0)—with Alabama, one of only two undefeated teams in the nation—and the team was captained by future college football hall-of-famer Alex Kroll. In 1961, Rutgers was considered a contender for the Rose Bowl, but was not selected because university president Mason Welch Gross did not express interest with the Rose Bowl's organizers. The following year, Rutgers once again went independent, and remained so until it joined the Big East Conference in 1991. In 1976, Rutgers declined an invitation to play an unranked McNeese State University at the inaugural Independence Bowl, feeling snubbed by more prestigious bowls despite its undefeated 11–0 season. In 1978, Rutgers appeared in its first bowl game, the Garden State Bowl, which it lost to Arizona State 34-18. The Rutgers College football team in 1882. Rutgers joined the Big East Conference in all sports in 1991. The team struggled to compete throughout the 1990s, facing powerhouse teams from Virginia Tech, Miami, Syracuse and West Virginia on a yearly basis. Following mixed results from Doug Graber and an abysmally disappointing tenure by previous coach Terry Shea, Greg Schiano took over as head coach for the 2000 season. Despite some early recruiting successes, his first five years resulted in losing seasons. However, in 2005, the team achieved its first winning season since Graber's 7-win, 4-loss campaign in 1992, notching a rematch bowl berth against Arizona State in the 2005 Insight Bowl. In that game, Rutgers lost in a shootout 45-40 but was led by a 100-yard rushing performance from a young freshman running back named Ray Rice. In 2006, Rutgers began the season with nine straight wins, culminating in a momentous 25-point comeback victory against the 3rd-ranked Louisville Cardinals in what became known as the "Pandemonium In Piscataway" game, with kicker Jeremy Ito sealing the 28-25 win with a late field goal. The following week, Rutgers rose to its highest rank ever in the polls, topping out at No. 3 in the AP Poll and No. 6 in the BCS. The Scarlet Knights achieved a record of 11–2 and a postseason rank of No. 12 in the AP Poll, including a first-ever postseason victory, beating Kansas State 37-10 in the Texas Bowl. The following year, Rutgers received its first ever preseason rank in the AP Poll at No. 16. 2007 was an up-and-down year for the Scarlet Knights, rising into the Top 10 for the second consecutive year, only to suffer back-to-back losses. However, the season was highlighted by a 30-27 upset of 2nd-ranked South Florida, and ended with an 8-5 record and a 52-30 drubbing of Ball State in the International Bowl. 2008 saw Rutgers again go 8-5, beginning the year with a disappointing 1-5 start before ripping off seven straight victories to finish the season, winning the PapaJohn's.com Bowl 29-23 over North Carolina State. In 2009, Rutgers entered the season the favorite to win the Big East Conference. However, the team opened the season with a loss to Cincinnati, who would end up with a perfect regular season and the conference title. Rutgers finished the season 9-4, defeating the UCF Knights 45-24 in the St. Petersburg Bowl. Rutgers' streak of five consecutive bowl appearances ended in 2010, a year marred by a spinal cord injury suffered by defensive lineman Eric LeGrand in the sixth game of the season against Army. Rutgers lost its final six games to finish with a record of 4-8. After the 2011 season, Schiano left Rutgers less than a week before national signing day to become the head coach of the Tampa Bay Buccaneers. Schiano left Rutgers with a 67-66 record over 11 seasons. Kyle Flood took over as head coach after Schiano's departure. In 2012, Rutgers began the season 7-0, including a 35-26 defeat of the Arkansas Razorbacks on the road in Fayetteville. The team reached a No. 15 ranking in both the BCS and AP Polls, before a surprise homecoming loss to the Kent State Golden Flashes, 35-23, in which sophomore quarterback Gary Nova was intercepted six times. Rutgers would go on to finish the regular season 9-3, including a heartbreaking 20-17 loss to the Louisville Cardinals in the last game of the season, in which the winner would clinch the conference's BCS Bowl berth. Louisville, led by Heisman hopeful Teddy Bridgewater, went on to defeat the Florida Gators in the Sugar Bowl, while Rutgers suffered yet another bowl loss in the Russell Athletic Bowl, dropping an overtime decision to the Virginia Tech Hokies, 13-10. 26 men have served as head coach of the Rutgers football team. Rutgers appeared in its tenth bowl game in its 145-year history in college football in 2014. As of 2014, Rutgers has won 6 bowls out of 10 bowl appearances. Traditional uniforms have featured red jerseys, white pants, and red helmets but the particular style has changed many times over the years. The helmets, in particular, have featured a wide range of logos. The Block R logo has seen various forms over the years but what fans now consider the "traditional" team logo debuted in 2001. Rutgers most recent uniforms feature a distinctive chrome helmet with a rotation of red, black, and white jerseys that are based on the team's knight mascot. Black jerseys and pants have been rarely used by the team. Although black pants were worn on a couple of occasions with white jerseys on the road, the black jerseys (with black pants) have only been used four times, in 2007, 2011, 2013, and most recently in 2014. They were worn on October 27, 2007 at Rutgers Stadium versus West Virginia in a torrential rain storm during a 31-3 loss, and with black helmets against Pittsburgh on October 8, 2011 in a 34-10 victory. The black jerseys were also used against West Virginia on October 29, 2011 in a 41-31 loss. Rutgers wore the all black jerseys with the chrome helmets against Arkansas on September 21, 2013 in the annual blackout game. Rutgers prevailed by a score of 28-24 after a late comeback led by quarterback Gary Nova and his 346 passing yards. Rutgers also worn the all black jersey in their first game against Michigan on October 4, 2014 in a 26-24 victory, their first conference win in the Big Ten. Rutgers has had many key contributing players in its 142-year history of college football. Dating back to the 1910s, the university has had several All-American candidates as well as a couple of once potential Heisman Trophy candidates in its storied history. 1910s Paul Robeson, born in Princeton, NJ played under future College Football Hall of Fame coach George Sanford. In his junior and senior years, playing as an end, Robeson was selected as an All-American in 1917 and 1918. After college he played three years in the early NFL, first with the Akron Pros in 1921 and then the Milwaukee Badgers in 1922. Robeson himself was inducted into the College Football Hall of Fame as a player in 1995. 1920s Homer Hazel first played for Rutgers in 1915, and then from 1923 to 1924. He was twice named an All-American, as an end in 1923 and a fullback in 1924. Hazel was elected to the College Football Hall of Fame as a player in 1951. 1950s Bill Austin, a native of Fanwood, NJ was one of the first recognized players from Rutgers. Gifted with a twisting and elusive running style, Austin led the Scarlet Knights in rushing three straight seasons. Despite being undersized at 5'11 and 170 lbs, Austin rushed for 2,073 yards while ranking up 204 points in his career with Rutgers. His 32-touchdown career ranks second in the Rutgers annals among all-time scorers and he had 13 interceptions from his defensive back position, which is one short of the all-time mark. Austin was inducted into the Rutgers Football Hall of Fame in 1988 and was recognized as an AP All-American in 1958. That year, Austin led the team to an 8–1 record, though the team could've gone 9-0 if Austin did not sit out the Quantico Marines game with an apparent hand injury. Austin was also considered a potential Heisman Trophy candidate, though the award was won by Pete Dawkins of Army that year. Austin went on to play for the Washington Redskins after being drafted in 1959. 1960s By the 1960s, Alex Kroll came onto the scene as a formidable opponent. At 6'2 228 lbs playing center, Kroll played was enrolled at Yale for two seasons before serving in the Army. He later formed a bond with the football captains at Rutgers before deciding to transfer there. Kroll was extremely physical in the trenches, giving way to his spot as the captain of the team in 1961. In his senior year biography, “his performance and leadership in 1960 helped Rutgers to a season which surpassed even the most optimistic of the previews. He has size, speed, hustle, and an uncanny ability to call defenses best equipped to stop the enemy.” Kroll was an excellent student in the classroom, played linebacker at times, and helped lead Rutgers to a 17–1 record in his time at Rutgers, earning him AP All-American center award in the undefeated season of 1961. 1970s The 1970s featured several great players for the Scarlet Knights. From 1971 to 1973, running back JJ Jennings tore up the record books, ranking him third all time at Rutgers with 2,935 yards rushing. He also led the nation in scoring during the 1973 season, with Honorable Mention of the AP All-American team. In the late 1970s, Rutgers football, led by coach Frank R. Burns, showed the nation its capabilities with an undefeated record in 1976 (11-0). That year included Rutgers star defensive tackle, Nate Toran, who finished his career with 52 sacks including 17 in 1976. Toran earned third team AP All-American that year and was joined by honorable mentions John Alexander, Jim Hughes, Henry Jenkins, and Mark Twitty. 1980s An array of different players from the 1980s led Rutgers to match-ups against teams such as Penn State, Michigan State, Alabama, and more. During that time, Deron Cherry, a standout safety for Rutgers, was an honorable AP All-American in 1980, followed by his teammate quarterback Ed McMichael. Other standouts included Jim Dumont Sr. and Tyronne Stowe, who holds the all-time record of 533 tackles. In the late 1980s, Scott Erney was an Honorable AP All-American mention, leading the team to key victories in 1988 over Michigan State and Penn State. Wide receiver Eric Young, who later went on to play baseball in the MLB, was another Honorable AP All-American mention. 1990s The early 1990s brought in a great recruiting class for Rutgers football, featuring running backs Bruce Presley and Terrell Willis. Together they were known as "Thunder and Lightning," they racked up 5,889 yards combined earning Presley 2nd team Freshman All-American honors in 1992, and Willis 1st team Freshman All-American honors in 1993. In 1994, tight end Marco Battaglia came onto the scene as a force. In his career "on the banks," Marco went from 27 catches, to 58, to 69 catches in 1995. With great size at 6'3 245 lbs, he was drafted in the second round of the 1996 NFL draft. 2000s Running back Ray Rice is a player who has stood out as a major icon in Rutgers Football. Recruited out of New Rochelle HS in New York, Rice beat out four other running backs his freshman year to earn a starting spot in 2005. He racked up 1,120 yards that season. In 2006, Rice finished second in the nation in rushing and was a finalist for the Maxwell Award, given to the best player in the country. By 2007, Rutgers University had set up a Heisman campaign for Rice. By the end of his career, Ray had amassed 4,926 yards on the ground and leads the Rutgers record book in almost every rushing category. He was 2nd team AP All-American two years in a row ('06-'07). Wide receiver Kenny Britt, and defensive back Devin McCourty were also Honorable Mentions on the AP All-American team during their careers. On July 30, 2013, coach Kyle Flood announced Rutgers will retire the jersey number 52 of paralyzed former player Eric LeGrand. He was honored in a ceremony September 14, 2013, when Rutgers played at home against Eastern Michigan University. It was the first number ever retired for the football program. The Scarlet Knights have had 3 players drafted in the first round of the NFL Draft. In 2010, Anthony Davis was selected 11th overall by the San Francisco 49ers, and Devin McCourty was chosen No. 27 overall by the New England Patriots. In 2009, Kenny Britt was chosen No. 30 overall by the Tennessee Titans. An Associated Press All-America selection, Britt became the first player in Rutgers history to be selected in the first round of the NFL Draft. Ten Scarlet Knights have been drafted in the last three years. 2010 also marked the fourth consecutive year that a Scarlet Knight has been taken on the draft’s first day after Brian Leonard (2007) and Ray Rice (2008) were both second-round draft selections. The 2012 NFL Draft saw wide receiver Mohamed Sanu drafted in the 3rd round to the Cincinnati Bengals, while the 2013 NFL Draft was the most productive in Rutgers history, with seven draft picks: Logan Ryan (Patriots), Duron Harmon (Patriots), Jawan Jamison (Redskins), Steve Beauharnais (Patriots), Khaseem Greene (Bears), DC Jefferson (Cardinals), and Marcus Cooper (49ers). Ryan, Harmon, Greene, and Cooper would go on to be productive rookies in the NFL the following season. In addition, ten other Rutgers players signed free agent contracts following the 2013 NFL Draft. The following year saw wide receiver Brandon Coleman and a number of other prominent players sign free agent deals as well, further bolstering the Rutgers presence in the NFL. Rutgers has a contract with SportsNet New York to air various football-related programming during the season. This formerly included games broadcast by ESPN Plus, but the Scarlet Knights now have an affiliation with the Big Ten Network. Football games air on the Rutgers Football Radio Network, which consists of three stations. The flagship is WOR in New York, a 50,000 watt clear channel station that is also the flagship for the university's men's basketball team. The other three stations in the network are WCTC, a low-power AM station that also carries Rutgers sports, WTMR, a Philadelphia area station, and WENJ, a South Jersey sports talk station. These games are produced by Nelligan Sports Marketing, a firm that finances college sports broadcasts throughout the nation. Chris Carlin is the voice of Rutgers football, with Ray Lucas serving as his color analyst. Bruce Beck subs for Lucas when he isn't available. MSG Network reporter Anthony Fucilli works as the sideline reporter while WFAN radio host Marc Malusis is the studio host. Inside Rutgers Football is the coach's show of Rutgers University's football team. The show, which debuted at the start of the 2001 season, is hosted by WNBC's Bruce Beck and features the Scarlet Knights' head football coach. ↑ Rutgers Visual Identity Manual (PDF). Rutgers, The State University of New Jersey. 2015-09-01. Retrieved 2016-08-15. ↑ "Rutgers Football History Capsule". Rutgers University Department of Intercollegiate Athletics. Retrieved August 15, 2012. ↑ "2012 Football Bowl Subdivision Records - All-Time Team Won-Loss Records" (PDF). National Collegiate Athletic Association. Retrieved August 15, 2012. ↑ "Rutgers Football Bowl History". Rutgers University Department of Intercollegiate Athletics. Retrieved August 15, 2012. 1 2 Pellowski, Michael (2008). Rutgers Football: A Gridiron Tradition in Scarlet. ↑ "1876 NCAA Division IA Football Power Ratings". ↑ "CFB Data Warehouse". Middle Three Conference Champions. Retrieved 2011-08-05. ↑ Burton, Chuck. "What Happened to the Cannon?". Lehigh Football Nation. Retrieved 2011-08-05. ↑ "Doing for Dear Old Rutgers". TIME.com. 1 December 1961. Retrieved 19 September 2014. ↑ "Army, Navy May Hold Key to Rose Bowl" in The Washington Post (2 December 1961). Page A16. Only authorship information given "by a staff reporter". ↑ "Son of former Rutgers coach sees Schiano as reincarnation of dad". MyCentralJersey.com. Retrieved 19 September 2014. ↑ "Rutgers Votes to Skip Independence Bowl" in The Washington Post (23 November 1976). Page D6. (No further authorship information available). ↑ Associated Press article (6 January 2011). "Rutgers Eric LeGrand Has Sensation Throughout Body". The New York Times. Retrieved 9 January 2011. ↑ "Tampa Bay hires Rutgers' Greg Schiano as Buccaneers' new head coach". Washington Post. Retrieved 30 January 2012. ↑ Barnett, Zach. "Rutgers wins first Lambert-Meadowlands Trophy". collegefootballtalk.nbcsports. NBC Sports. Retrieved 26 April 2015. ↑ "5 Rutgers football players arrested in connection with home invasions and assault". NJ.com. Retrieved 2015-12-08. ↑ "Change in Athletics at Rutgers University--New Brunswick". www.scarletknights.com. Retrieved 2015-12-08. ↑ "Chris Ash Named Head Football Coach at Rutgers". www.scarletknights.com. Retrieved 2015-12-08. ↑ Rutgers Historical Scores at Division I-A Historical Scores, published by James Howell. Accessed on 12 January 2007. ↑ "Rutgers to retire LeGrand's No. 52". myfoxny. Retrieved 30 July 2013. ↑ "SNY to Become Official Home of Rutgers Athletics". Retrieved 19 September 2014. ↑ "Rutgers Scarlet Knights Football Schedules and Future Schedules". fbschedules.com. Retrieved 2014-08-24. Wikimedia Commons has media related to Rutgers Scarlet Knights football. "On the Banks of the Old Raritan"